The most enigmatic football star of the eighties and nineties Paul ‘Gazza’ Gascoigne was a footballing genius who could have eclipsed the great Pele if his skills with the ball and innate vision had been matched with self control and discipline. He was a certain selection for England when he was fit and provided some special moments in an England shirt. Paul Gascoigne’s England contribution in terms of tournaments was restricted to the World Cup in Italy in 1990 and the European Championships in England in 1996. He missed the trip to Sweden for the 1992 European Championships through injury, and the team missed him too, coming bottom of their group. England then failed to qualify for the World Cup in 1994, and although the team made it in 1998, Gazza didn’t make the squad. Italia 90 was the making of Gazza’s reputation as an international star. After the traditionally frustrating group stage the team began to gel and believe in themselves, and this was in no small part down to Gazza’s growth as a top class midfield player. Although he didn’t score any goals in the competition, his ability to read the game and send accurate, perfectly weighted passes to players such as Gary Lineker and David Platt galvanised the team as they progressed through the second round and quarter-final stages to a show-down with Germany in the semis. In that match Gascoigne bested the legendary Lothar Matteus, but at the same time, a trademark reckless challenge got him a yellow card which would have excluded him from the final. In the end that proved irrelevant, as Germany won a penalty shoot-out after the game ended at 1-1. But the tears that flowed when he realised he couldn’t play the next match proved to be the start of the press attention that still follows his every move even today. 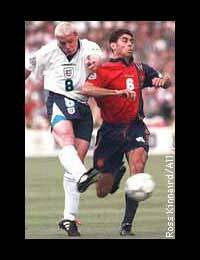 In 1996 England hosted the European Championships. There was a real feeling around the country that the team could do very well, and that proved to be the case, reaching the semi-finals where they went out to Germany, again on penalties. Gascoigne was at the centre of a very strong and creative midfield, with players such as Sheringham, Platt and Ince around him. Although the team reached the semi-final and lost it by the narrowest possible margin, for many people the best performance was the demolition of the Dutch team 4-1 in the last group match. Although Gascoigne didn’t score in the 1990 World Cup it was his superbly flighted free kick that David Platt spectacularly volleyed in on the turn to beat Belgium at the very end of the second round match (for many people the goal of the tournament). During the World Cup qualifying rounds England played Turkey in 1992 at Wembley and after opening the scoring, Gascoigne finished the rout with a delightful dribble through the defence and round the keeper. The best was the flick over Colin Hendry and follow up volley to score the winner against Scotland in the 1996 European Championship. This was followed up by an iconic celebration with his team-mates, imitating the ‘dentist’s chair’ drinking session that had the papers in a lather on the team’s pre-tournament trip to Japan. The goal was voted the best ever at Wembley by a poll in 2000. After his last comeback from injury Gascoigne was playing well at Glasgow Rangers and was expecting to make the final squad for the 1998 World Cup in France but Glenn Hoddle, the England manager, decided not to take him, and he never played for England again. Gazza’s problems on and off the field are well documented and they aren’t relevant to a discussion of his England performances, except to say that they robbed him of more performances. Even with his problems he amassed 57 caps and it isn’t a coincidence that both England’s strongest tournament finishes since winning the World Cup in 1966 were those that were able to make full use of the mercurial talent that is Paul Gascoigne.